Trying to judge the hardness of a foam sample by hand-feel is almost impossible. Every person will have a different opinion. To ensure consistent Quality Control of foam production, it is necessary to have an industry recognised foam hardness test procedure that will give an accurate, recordable value. 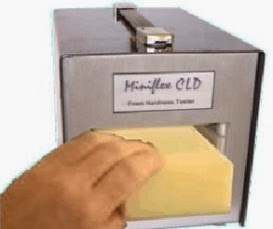 The foam industry measures foam hardness by various different tests.These can be grouped as either ILD (Indentation Load Deflection) or CLD (Compression Load Deflection) type tests. The test procedure first measures the thickness of the foam sample (pre-load). It is then compressed 3 times to 30% of its original thickness (pre-flex) at a defined speed. Finally, the sample is compressed to 60% of its original thickness and the force necessary to do this is measured and recorded. This force, normally expressed as pressure in kilopascals (kPa), is the hardness value. • Test parameters displayed with graph simultaneously.